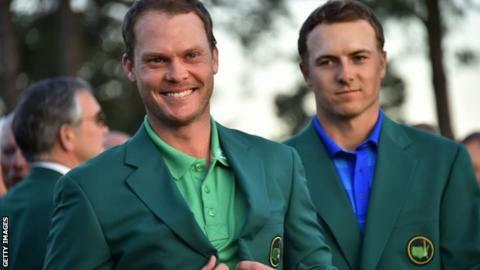 Winning the Masters is a "fantastic start" to achieving "special things" in golf, says Danny Willett. The Yorkshireman, 28, is the first European winner at Augusta since 1999 and only the fourth British champion. "It's a great feeling and hopefully one we can have many more times," said Willett of his first major victory. Willett's manager Chubby Chandler said the golfer could win another major this year and become number one in the world "without any doubt". Carding a final-round five-under-par 67, the Englishman took advantage of defending champion Jordan Spieth dropping six shots in three holes. The last European to win at Augusta was Spaniard Jose Maria Olazabal, while the only other British champions have been Nick Faldo (1989, 1990, 1996), Sandy Lyle (1988) and Ian Woosnam (1991). Chandler said Willett, a 2007 Walker Cup team-mate of three-time major winner Rory McIlroy, could "become one of the greats of his time". "He won't be distracted. He knows exactly what he's trying to do. Winning the Masters is the start of the journey, not the end of the journey," said Chandler. "He knows exactly how many majors Rory has won and he will want to get up there and past Rory's tally. If you take Tiger Woods out, what is the next best tally of majors among current players? Phil Mickeslon with five." The former English amateur champion turned professional in 2008, but his progress has been slower than others of his generation, such as McIlroy, Spieth and Rickie Fowler, with ongoing back problems halting his progress. But Chandler revealed that the vicar's son, once the top-ranked amateur golfer in the world, carefully managed his back problems and used his father, Steve, as a psychologist. "He had his trainer in Augusta and he's got a terrible back, so once a month he has a check-up, and then he goes on and does his thing properly," he said. "He works so hard in the gym, partly because of his back and because he wants to, so he will be here for a long time." Willett, who described his victory on Sunday as "surreal", admitted he is not yet at the level of world number three McIlroy, 26, and world number two Spieth, 22. "They've obviously achieved a good bit more than me. I've still got a bit of a way to go to be up there with those boys," added Willett, who moves to ninth in the world rankings after his Augusta win. "But it is a fantastic start in the right direction of doing pretty special things in big tournaments. "I'm just looking forward to being in that illustrious group of major winners, making sure I move forward in my game and seeing what else I can achieve."